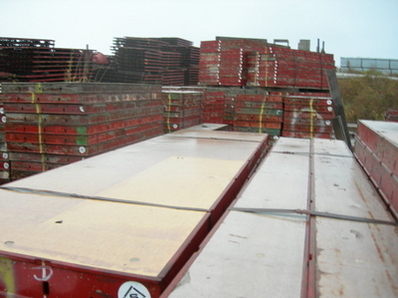 Symons concrete forms for sale in VERY GOOD condition. 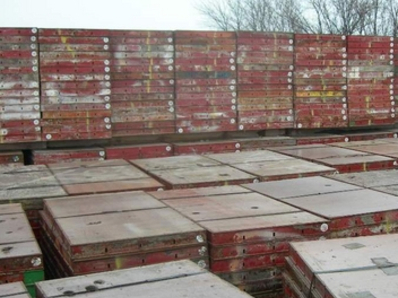 This is a large quantity of used SYMONS brand concrete wall forms with all of the sizes & hardware available to choose from. Reach our sales department for used SYMONS concrete forms at GREAT PRICES. SYMONS Concrete Formwork System. The SYMONS concrete forming system is a pre-engineered, factory-built, reusable concrete forming system. It may be used in handset or gang form applications, for commercial or residential structures. SYMONS concrete form gangs only weigh about 6.5 pounds per square foot with hardware and lumber walers. SYMONS concrete forms can be set directly on the concrete footing working to a chalk line or on lumber plates. Plates are recommended because they provide a positive on-line wall pattern and level out rough areas on the footing. 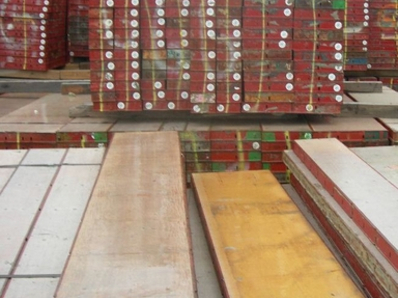 Plates function to preform the position and size of pilasters, changes in wall thickness, locate corners, etc. Plates extend a level on-line surface for setting grade beam walls which only bear on intermittently spaced footing pads. Symons concrete forms should be nailed down so that they will stay on line. (The SYMONS concrete forms face should be flush with inside edge of plate.) All SYMONS concrete forms and end rails contain 2 wide-spaced nail holes. The first Symons concrete form is nailed at both nail holes. Subsequent Symons concrete forms require only one nail through the leading nail hole relative to panel setting direction. The Wedge Bolt, side rail tie connection is designed with easy-fit tolerances for speed of assembly. These tolerances permit up to ¼" of slack in a tie spreader action control of wall thickness. Any slack present between opposing forms is removed by lateral pressure during concrete placement. For this reason, panels should be nailed down, aligned and braced on one side of the wall only. The opposing forms are then free to pull out any tie slack without affecting alignment. A double thickness plate can be utilized to gain a small amount of extra form height, as an example, an 8' panel setting on a double plate will form an 8'-3" wall. This method is much easier than attempting to nail wood on top of the form.